Netflix’s ambitious Internet TV plans are forging ahead, with three new set-top box partners to integrate the company’s ‘Watch Now’ video streaming service into their products by the end of year. The company has previously announced a partnership with Korean manufacturer LG Electronics to stream movies, TV shows, and other content to LG high-definition televisions or set-top boxes by the second half of 2008. So who might these three additional hardware partners be? Reed has, on a number of occasions, gone on record talking up Netfllix’s ambitions to get its Internet TV service onto all manner of hardware including next generation games consoles, along with networked DVD players and other set-top boxes or Internet-connected televisions. 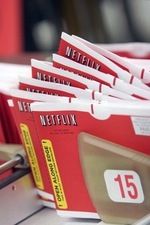 More specifically, in February there were reports that the company was conducting market research relating to its ‘Watch Now’ service being offered on Microsoft’s XBox 360 and Sony’s PlayStation 3 — although, as we noted at the time, it’s unlikely that either company would want to enter into an agreement with Netflix. Microsoft already has a competing Internet TV service of its own with the XBox Live Marketplace, and Sony has plans to launch something similar. Instead, it’s our bet that we’ll see Netflix compatibility added to a number of media streamers, such as those produced by D-Link and KISS (Linksys). Other likely contenders are Internet-connected televisions from Sharp or Samsung, and as an outside possibility TiVo, but again, the company already supports a competing service in Amazon’s UnBox. I can envision Microsoft embracing Netflix on the 360 instead of continuing to manage their low-content service. Then again, it may just be wishful thinking on my part. Unless Netflix offers unlimited streaming (as they do now via the web), they’re probably no better or worse than anyone else. Though they do have a lot of content. You could be right as Microsoft does have a track record of partnering, contrary to their recent Apple-esque XBox and Zune strategies. But then again, surely MS would want a rev share with Netflix, and the latter is probably losing money on their unlimited ‘Watch Now’ service. I have subscribed to Blockbuster and Netflix for five years now since I am home bound. I noticed that you are wanting reviews for a trial of the Vudu box. I am uncertain of how I enter? I went to the number sequence site. My number was 1444. Is there something else I should do? Thank you so much!